Made from Japanese Kimono - Website of studiohyacinth! I grew up in Japan. As a child, I recall how my mother and grandmother enjoyed wearing their traditional Japanese Kimonos and I inherited their appreciation and love of the exquisite designs and colors. Today I woke out of my home studio in suburb of Boston, Massachusetts. Although we live an American lifestyle, I have continued to carry on the Japanese traditional of having the Kimono as a part of our living simply because of the extraordinary beauty that a Japanese Kimono adds to a home. We have a Kimono hanging as a piece of art on the wall in our living room. Our guests are awed at its unbelievably intricate hand-sewn designs on silk. Using the Kimonos I import from Japan, I create a variety of apparel and other items. On my website you can see some of my designs. 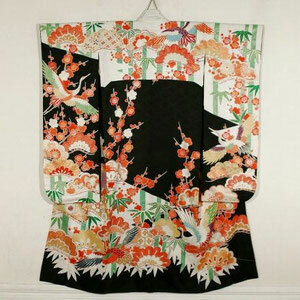 However, you will gain an even better appreciation of the superb beauty of Kimono when you feel the silk and see the iridescent brilliance of its color. If you love the luxurious touch of silk and if you admire Japanese art, you will find great pleasure in owning and wearing fashions I have created from authentic Kimonos.